Every successful property manager has common traits that got them ahead in the industry: they notice problems, and they find ways to fix them before everyone else. Because they are assertive, not complacent, in solving problems, their business is more efficient, reliable, and profitable. If you are looking to get ahead in today’s highly competitive industry, then you will need to do the same and Monnit can help. Managers of hotels, commercial properties, residential properties, and foreclosed properties, have all experienced the same problem: monitoring properties is expensive. Every year, there are billions of dollars in losses due to property damage, mechanical failure, theft, energy waste, and more. In the past, these problems were difficult to solve. If you didn’t hire expensive maintenance teams to do regular, manual checks on every facet of a building’s infrastructure, problems were inevitable. Thanks to the Internet of Things, everything has changed. The Internet of Things enables people to monitor and track various conditions in any environment. Previously, available solutions were expensive and difficult to use. 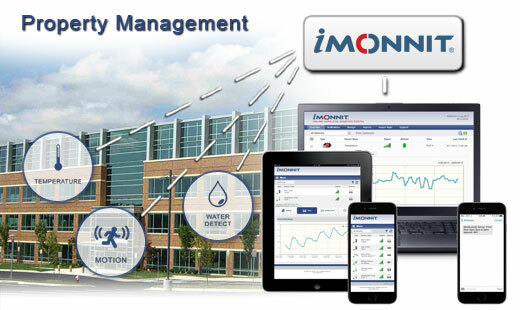 This has since changed with Monnit’s affordable remote monitoring solutions, which make it easy to monitor multiple aspects of your facilities, from anywhere, at any time. Example: In the United States alone, the annual cost of water damage is over 2.5 billion dollars. Whether from a frozen pipe bursting, water heater breaking, or just a simple toilet or faucet plumbing issue, water damage is likely to occur if not caught quickly. Generally, the cost of treating and repairing water damage is about $10 to $15 per square foot on average. If you are a property manager, you know how quickly these costs can add up. Wireless temperature sensors can alert you if the temperature falls below freezing and water detection sensors can alert you the moment a water leak is detected. Keeping temperatures in your building comfortable can sometimes put your heating and cooling systems to the ultimate test. Often, we take them for granted, just assuming that they will work without any problems. Unfortunately, your furnaces, HVAC units, and boilers are constantly at risk. If you have experienced problems with this in the past, you know how expensive these failures can be, especially if not caught in a timely manner. Luckily, that’s where we come in. Managers of hotels, commercial properties, foreclosed properties, offices, or any other building, have all experienced problems with their HVAC, heating, and/or boiler systems. If there is anything irregular with the temperature, electrical current, and/or humidity around your machinery, they run a higher risk of costly failure. In the past, these problems were difficult to solve. If you didn’t hire expensive maintenance teams to do regular maintenance checks on these systems, problems were inevitable. Further, calendar maintenance checks are often ineffective, as problems can arise at any moment. Because these problems are so common and have been around for so long, many people/businesses became complacent, considering these variable costs as mandatory. Then, along came the internet of things, and suddenly everything changed. The internet of things enables people to use sensors to monitor different conditions in any environment, which when paired with your machinery, can potentially save you thousands of dollars in unnecessary damages. For a long time, the available solutions were too expensive and difficult to use. This has since changed with Monnit’s affordable remote monitoring system, which makes it easy to monitor all of your machinery at once, from anywhere, at any time. New Cellular Gateway Signal Booster – Now Available! Today, Monnit introduced a new product for US and Canadian customers using Monnit Cellular Gateways with their wireless sensor networks. 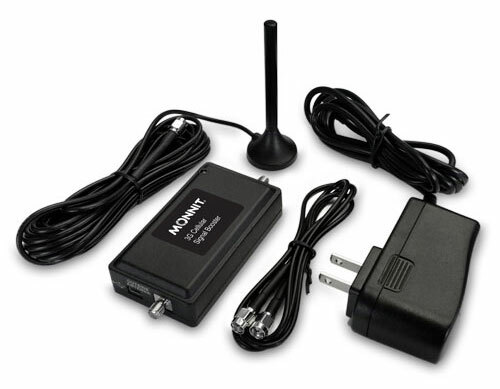 The Monnit 3G Cellular Signal Booster provides a stronger, more reliable cellular data signal for successful communication between sensor networks and the online monitoring system, reducing data resends and lost connections. The Cellular signal booster kit is FCC and Industry Canada certified and comes with everything needed to get up and running (3G signal booster, outdoor antenna, 3 ft. extension cable and power supply). If you are using a Monnit Cellular gateway and are trying to monitor a sensor network in a location that has poor cellular reception, we encourage you to learn more about this new product. It can also be used with 2G cellular gateways if needed. About Monnit: Focused on simplicity, Monnit Wireless Sensors can be setup, gathering data and notifying users of concerns in just a few short minutes. Monnit currently provides over 50 unique wireless sensor types for measuring temperature, humidity, door and window (open/close), motion, water, activity, dry contact and a variety of other conditions that are critical to businesses. All Monnit wireless sensors include free basic iMonnit online sensor monitoring, which allows for customization of sensor operation and reviewing sensor data from any web enabled device, such as computers, tablets or smart phones. The system can also send notifications via text, email or voice call if user defined conditions are met or exceeded. For more information on Monnit’s low cost monitoring solution, call (801) 561-5555 or visit www.monnit.com. Monnit is pleased to have had the opportunity to sponsor the RIoT Challenge at the recent Robotics and Internet of Things Conference in Utah. The challenge provided an opportunity for developers interested in the Internet of Things, to form teams and compete in a hands-on development challenge to come up with interesting applications for the Internet of Things and work towards developing their solution throughout the day-long challenge. Monnit provided wireless sensors, gateways and software for the teams to develop with, and had employees on hand to assist and encourage the competing teams. There were 10 teams that participated in the challenge, and they all created some very interesting and cool projects using Monnit sensors. At the end of the day, the projects were judged by a panel and the top teams received cash prizes to help get their ideas off the ground. The winning team (TimberShark), created a beehive with built-in sensors to monitor the hives health remotely without disturbing the bees. Their solution perfectly represents the impact that the Internet of Things can have, by helping to solve the problem of a collapsing bee population.